The tickets highlighted in yellow have been claimed as of today, Monday, December 17, 2018! 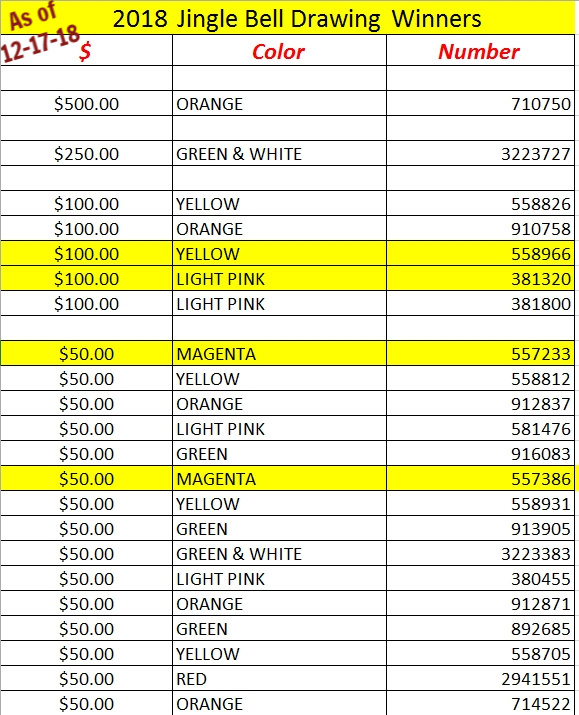 The tickets highlighted in yellow have been claimed as of today, Monday, December 17, 2018. To claim your prize, please present your winning ticket to the Chamber Office BY 1 PM on Friday, December 28, 2018. All tickets will be null and void after that day. Must be 18 years of age to collecting winnings. Chamber Office hours are Monday – Friday, 9 am – 1 pm. Note the Chamber Office will be closed Thursday, December 20, 2018 – Tuesday, December 25, 2018.